How do you know when’s the right time to go all in on your opportunity or business idea? Abe Kamarck joins us to talk about how he made the decision to go 100% into his latest food startup. He also shares why he wouldn’t do it again. 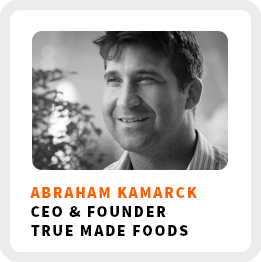 He’s the CEO and founder of True Made Foods. He makes ketchup, BBQ sauce and siracha using veggies instead of sugar. Ironically, he’s not a fan of ketchup, but his kids are obsessed with it. He figured he could get them to eat more veggies by putting more veggies in their ketchup. Why now is one of the best times to have a food startup. Pros and cons of lifestyle entrepreneurship versus building a scalable business. The only reason to sell your food product at a farmers market. How to ramp up your product’s velocity metric to gain distribution. How to use Amazon to test your marketing message. Core work activities + habits: 1) Sales. 2) Fundraising. 3) Consumer marketing. Definition of success: Continuing to get better and grow. Creating a product people love. 90-day goal: Make as much money in Q1 and Q1 of 2018 as they did in all of 2017. 1) You’re going to need more money than you think you will. 2) Figure out what your personal financial situation is and always anticipate that making a good salary will take longer than you think. 3) Figure out the metrics investors are looking for and find a way to bootstrap for a while.